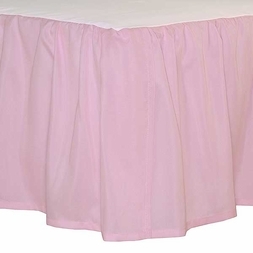 This sweet bubble gum pink bedskirt is the perfect accent to a feminine bedroom. So versatile, the pink hue is a match for practically every pastel-colored bedding there is! Bedskirt is a ruffled style, with open pleated corners to accommodate bed posts and frames. 100% Polyester Microfiber - super soft fabric !